I called in at the National Railway Museum in York. I'd strongly recommend it: it's free and it's fascinating (although a little full of slightly strange people ogling railway engines and spare parts). But it reminded me just how far standards have fallen. Travelling on the East Coast line used to be a pleasure. But since National Express took over the franchise from GNER almost everything has got worse - comfort, standard of food, ease of booking, lack of newspapers. They have now stopped the restaurant service and are in the process of putting back ticket barriers on platforms. Fortunately, they are losing money so there is a chance they will have to hand back the franchise, as GNER did. Hopefully any new franchise will include service standards. 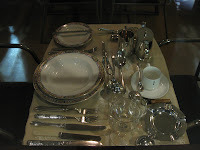 Here is a photo of LNER's place setting for dinner. Followed by the current effort. Enthusiasts may appreciate this background information on the route. A film was made about it in the 1950s. Does this make me a grumpy old man? Probably. But I feel better for writing this. And it does reinforce one of my messages: as a country, we too often forget the value of things as we focus on the price. Its a real struggle to think of something to say. I listened to the budget driving along the M1 (if I were witty and concise I would make a pun along the lines of it doesn't matter what measure you use, M0, M1,M3 or M4, the Government has lost control, but as I'm not I won't) and struggled to keep awake. The other options were a Flying Pickets CD or Jeremy Vine: the latter would have been even worse and I saved the former for driving through London. It's not Darling's fault. I suspect history will show he was a decent person doing his best to cope with what was left behind (think of the analogy of the person with the shovel following the elephant). The debt position is truly scary. Not just the scale of what was announced yesterday, but the fact the amounts assume a major pick up in the economy quite quickly. There will have to be savage cuts in Government spending in due course (fortunately there's so much stupid spending that will be easier done than said, although cutting public sector pensions will probably cause tension and strikes). There were lots of superficial schemes to provide help for specific groups or sectors - but as is typical there were very few details which probably means they won't actually happen. As Cameron noted in his reply, the schemes announced in the last budget mostly haven't been taken up. The tax increase for higher paid people is silly: it will raise no extra money, in fact it may lead to lower revenues as people adjust their behaviour. It will serve one purpose: it is highly political. Coupled with the rushed attempt to change MP's allowances announced by Brown on Monday, it is an attempt to widen the gap between Labour and the Conservatives and to show the Conservatives as only caring for the wealthy. I suspect that won't work: it's too easy to point out that every Labour Government has left office with unemployment higher than when it came in, and with Government finances in a worse state. So, I think it was another irrelevant budget. Actually, the strategy of making a lot of noise and doing too little too late may not be such a bad one. Government actions often have unintended consequences, and letting the economy sort itself out with little interference will probably work, although more slowly and with more pain than might have been the case. I bumped into a London estate agent today as I headed home: his comment (and he wasn't trying to buy or sell anything for me, so I believe him) was that there were signs of activity and London prices below £1m seemed to have reached a floor. Activity above that was still very slow. He was also pleased that bankers had become even more reviled than him. Sad to read about the death of the previous Bank of England Governor, Eddie George. He was very successful as the first Governor managing an independent monetary policy. This was after expressing grave concern about the transfer of bank regulation to a new Financial Services Authority, without any clear responsibilities for financial stability being allocated. At Gordon Brown's instigation. In the last year, he saw the consequence of that bad policy. a) The “new labour” Government project has mostly been about presentation, not implementation. True in the beginning (see Sultans of Spin, written 10 years ago) and true now – when almost none of the announced initiatives to help the economic problems have been implemented. Guido Fawkes. Guido is the blogger who broke the recent story, and incidentally a number of other scandals. I enjoy his blog: he is a libertarian who recognises the flaws in politicians (they are after all human), but despises the hypocrisy in so many of them. Most of his posts are not about serious issues – but some are, and they usually present new information (at least to those of us not in the Westminster bubble). He is not (despite some press comment) particularly right wing; he’s (to repeat the point) a libertarian. c) Old media (MSM, or mainstream media in blog terms) like newspapers TV and radio have been shown to be at best ineffective and at worst unreliable in telling us what’s going on. Guido wrote about this in the Times (and on his blog): newspapers primarily nowadays write what they have been told to write by their informants. They do not generally apply a veneer of editorial control. The most blatant example recently was the Telegraph spinning the Labour line about the email scandal, apparently primarily because their journalists were drinking buddies of Labour’s attack squad. MSM is usually necessary to bring a story to fruition, as happened in this case, but too rarely does it initiate anything. Other examples: listen to the Today programme. Very rarely do its lead stories talk about what has happened and analyse that; they usually talk about what is going to be announced or happen and talk about what the initiator wants. This is called leading the news, but its really about unthinkingly spinning a line. What to do? First, recognise MSM for what it is: the presentation of what people want to be presented, and assume its misleading, be it celebrity relationships or Government policies. Second, read/listen/watch more than one media channel, including the blogosphere. I haven't seen In the Loop yet - but I'm sure it will describe the inevitable outcome of the new labour project very well. Or of course just get on with your life and ignore it all. In a week when the Government now makes ISPs keep records of what we all read on the web, and a month when it has started to keep records of where we all go on holiday its very satisfying that it’s been caught out because it can’t keep control of its data. But that’s a subject for another day.